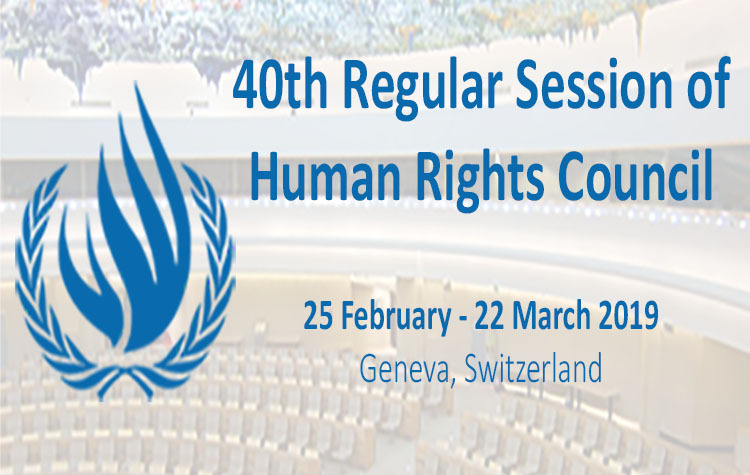 The 40th regular session of the UN Human Rights Council took place from 25 February to 22 March 2019. Over the four-week session, FORUM-ASIA delivered or supported nine oral statements. Its advocacy focused on Myanmar, Sri Lanka, and human rights defenders, which were on the Council’s agenda, as well as calling for increased attention on other Asian countries including the Philippines. It also organised six side events on the situations in India, Myanmar, and Sri Lanka, as well as on women human rights defenders; freedom of expression and of religion or belief in the digital age; and new authoritarianism and its implications to human rights and civil society. The Special Rapporteur on the situation of human rights in Myanmar presented her report to the Council. In the interactive dialogue that followed, FORUM-ASIA echoed the Special Rapporteur’s calls for “concrete action to advance human rights, accountability and the democratic transition in Myanmar.” FORUM-ASIA organised a side event with the participation of the Special Rapporteur, human rights defenders, and Rohingya refugees on the need for international accountability in Myanmar. The High Commissioner for Human Rights also presented a report on the situation of Rohingya in Rakhine state. In the general debate that followed, FORUM-ASIA called on the Council to take immediate steps to operationalise the Independent Investigative Mechanism (IIM) on Myanmar and on the international community to refer Myanmar to the International Criminal Court (ICC) to ensure accountability for grave international crimes including genocide, crimes against humanity and war crimes. The Council adopted a resolution on Myanmar that recalls the UN Security Council’s authority to refer the situation in Myanmar to the ICC, and reiterates the “urgent need to ensure that all those responsible for crimes under international law, (…) in particular in Rakhine, Kachin and Shan States, are held to account through credible and independent national or international criminal justice mechanisms.” The resolution further calls for the expeditious operationalisation of the ongoing independent mechanism created by the Council in September 2018 to collect, consolidate, preserve and analyse evidence of the serious international crimes and violations, and prepare case files to facilitate and expedite fair and independent criminal proceedings; and extends the mandate of the Special Rapporteur on the situation of human rights in Myanmar for another year. The resolution reflected FORUM-ASIA’s repeated calls for a comprehensive, independent inquiry in to the involvement of the UN in Myanmar since 2011 to establish whether everything possible to prevent or mitigate the crisis was done, and invites the UN Secretary-General to present the report of the inquiry to the Council in March 2020. FORUM-ASIA welcomed the resolution in a press release, joint NGO end of session statement, and joint NGO letter to the UN Secretary-General. During the general debate on human rights situations that require the Council’s attention, FORUM-ASIA expressed concern over the increasing threats to freedom of expression in the Philippines, and the systematic targeting of journalists, independent media, and human rights defenders who have reported on the estimated over 27,000 deaths in the government’s ‘war on drugs’, including the politically motivated charges against journalist Maria Ressa. In its advocacy, FORUM-ASIA has been calling on the Council to increase scrutiny on the Philippines, with the aim of urgently initiating an independent international investigation into the killings, as well to mandate the High Commissioner to monitor and report on the government’s descent toward authoritarianism. FORUM-ASIA also raised concerns on this issue by co-organising a cross-regional side event on new authoritarianism and its implications to human rights and civil society, which included the Chair of the Commission on Human Rights of the Philippines as one of the speakers. In her annual report, the High Commissioner for Human Rights expressed concerns on the lack of accountability for the killings “in the context of the campaign against illegal drugs since mid-2016,” and encouraged the Philippines to comply with human rights standards in this campaign. She emphasised that “the drug policies in place in the Philippines, and its lack of respect for rule of law and international standards, should not be considered a model by any country.” She also noted threats against human rights defenders, journalists, and opposition politicians, as well as Special Rapporteurs of the Council. Australia, Belgium, France, Germany, Iceland, and the United Kingdom, as well as the European Union, included the Philippines in their statements this session. While these statements are helpful in supporting the work of human rights defenders in the country, stronger Council action is needed. In their end of the session statement, FORUM-ASIA and other NGOs expressed “regret that States have yet again failed to initiate Council action on the Philippines,” and called on the Council to take action at its next session. The High Commissioner for Human Rights presented her report on reconciliation, accountability, and human rights in Sri Lanka. During the interactive dialogue that followed, FORUM-ASIA called on Sri Lanka to develop a concrete, transparent and time-bound action plan for the implementation of its commitments under resolution 30/1 in collaboration with OHCHR, and called on the Council to step up its engagement on Sri Lanka through measures such as an OHCHR field office, a Special Rapporteur and an independent international mechanism to gather and preserve evidence to assist the accountability process. FORUM-ASIA made similar calls in its advocacy, including in a joint civil society letter to states and in a joint NGO statement at the end of the session. It also co-organised a side event on Sri Lanka with other NGOs. It raised concerns on the recent intimidation and reprisals against the Human Rights Commission of Sri Lanka in its statement on national human rights institutions. The Special Rapporteur on the situation of human rights defenders presented his report on women human rights defenders to the Council. 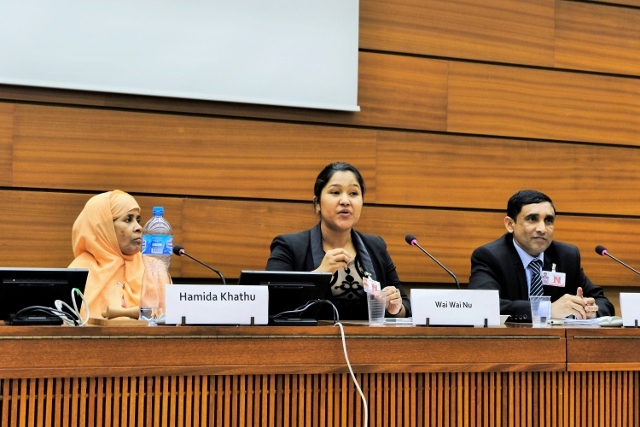 During the general debate on the promotion and protection of all human rights, FORUM-ASIA echoed the Special Rapporteur’s recommendations and called on states to prioritise the protection of women human rights defenders, including in online spaces, and immediately and fully investigate all threats and attacks against them while ensuring access to effective remedy. During this debate, FORUM-ASIA drew attention to cases of women human rights defenders in India and the Maldives. 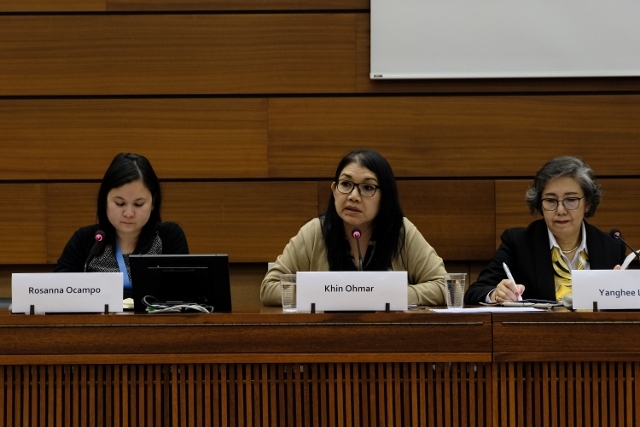 FORUM-ASIA supported a joint NGO statement calling on the Council “to take action on credible allegations of violations against WHRDs” and end the “tokenisation of WHRD participation through genuine consultation”, and co-sponsored a side event on women human rights defenders with the participation of a defender from Myanmar. Throughout the session, FORUM-ASIA raised issues affecting human rights defenders across Asia, including in Bangladesh, Cambodia, India, Malaysia, Maldives, Myanmar, the Philippines, Sri Lanka, and Thailand. FORUM-ASIA called on the Council to adopt a strong and gender sensitive resolution on the protection of environmental human rights defenders that articulates the human rights obligations of states as well as businesses and development finance institutions in relation to environmental human rights defenders.